Entries are now being accepted for the 7th annual Undergraduate Library Research Award (ULRA) competition sponsored by the Hesburgh Libraries and the Center for Undergraduate Scholarly Engagement (CUSE). 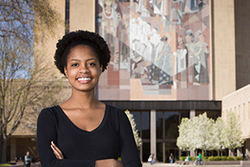 Established in 2010 to promote critical thinking, intellectual discovery, and the advancement of lifelong learning, the ULRA recognizes undergraduate students who demonstrate excellent research skills by their broad use of library expertise, resources, collections, and services in their scholarly and creative projects. Along with their projects, entrants must submit an essay (800-1,000 words) about the library resources consulted and integrated into their research or creative work. The essay should show a deep and significant understanding of the research process, outlining inquiry methods and highlighting specific, unique Hesburgh Libraries contributions. Political science major Madelynn Green won first prize in 2015 for utilizing research skills throughout her senior thesis, “From Decay to Cool: Street Art and Urban Renewal in Kreuzberg, Berlin and the East End of London.” Her adviser was Ricardo Ramirez, associate professor of political science. Green wrote her thesis on street art, or images and text that are illegally painted on public and private property. Her work analyzes how international funding has constrained local efforts to address AIDS in Uganda. 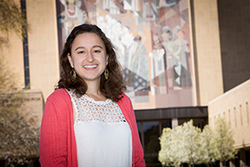 Mediate initiated her research while studying in the Notre Dame London program. From there, she consulted electronic resources, databases, articles, and e-books to explore her broad topic and also received assistance from a Notre Dame London Undergraduate Program librarian, Alice Tyrell. Winning projects and recorded 3- to 5-minute lightning talk videos will be preserved in CurateND, Notre Dame’s digital institutional repository. Winners will be recognized at the ULRA Awards Reception at the Undergraduate Scholars Conference on April 29. Deadline for submissions is 11:59 p.m. April 13. For information, tips, and submissions, click here.